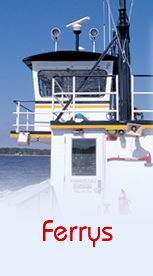 The Bayview side of the Bayview-Aurora ferry is about five miles east of historic Bath on Hwy. NC 92, just east of Bayview. 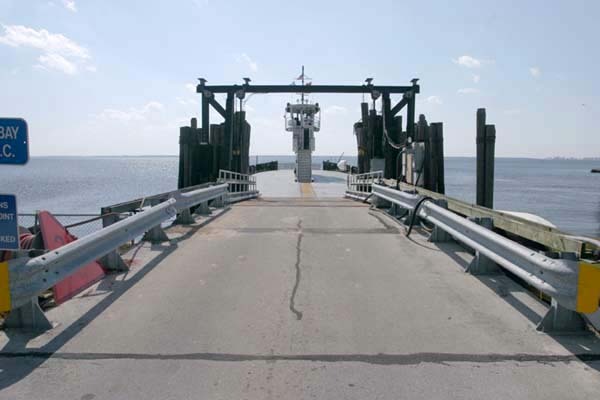 It crosses the Pamlico River to reach the north end of Hwy. NC 306, north of Aurora. A sign at the loading lanes informs you it is a 4-mile crossing, but it takes about 30 minutes. You can find its location on the Coastal Guide Map. 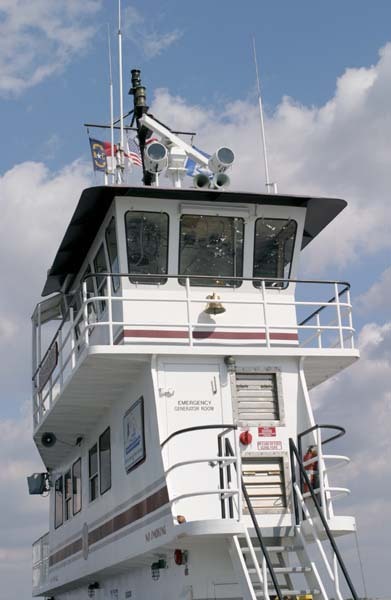 Left - Two photos of the "Ocracoke" waiting to load at Bayview. Below - The crew on board the "Ocracoke" as it departs Bayview. 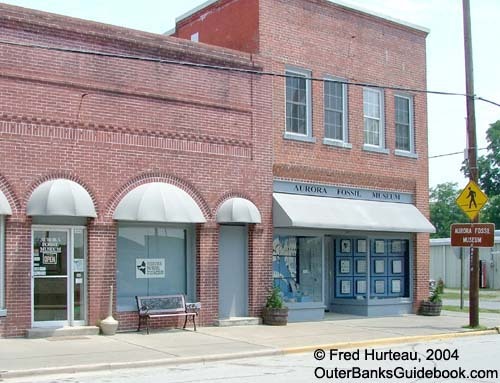 Right - Another view of the "Ocracoke". Unlike the other ferry rides on this trip, there were almost more crew than passengers. The crew seemed more approachable and seemed to have a little time to talk. 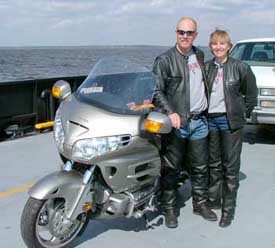 Perhaps having a very small pilot house on the "Ocracoke", and the fact that is was a perfectly beautiful day meant they were more obliged to be on-deck. In any event, it was nice to chat with them for a bit. The one thing you can't miss on this crossing is the huge mound of dirt visible across the river to the southwest. You might wonder where such a mound could possibly come from in this flat coastal land, just a breath above sea level. As you get closer, you can tell there is also some sort of huge industrial facility next to it, and you begin to realize the massive scale of this place. It is absolutely immense. What you're seeing is the PCS Phosphate Mine, which stretches the entire five miles from the ferry landing to Aurora. 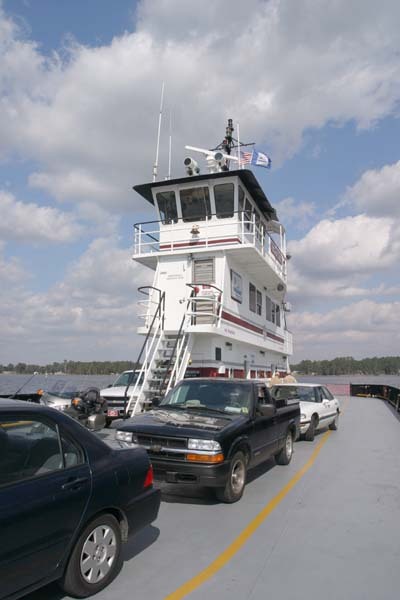 Arriving at the landing on the south bank of the Pamlico puts you on NC 306 again, which then runs south past the phosphate mine to Aurora, though little of the facility is visible behind the trees that buffer the highway. 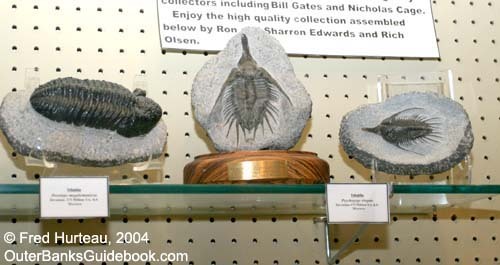 If you have an interest in fossils, you should stop in Aurora to visit the Aurora Fossil Museum. 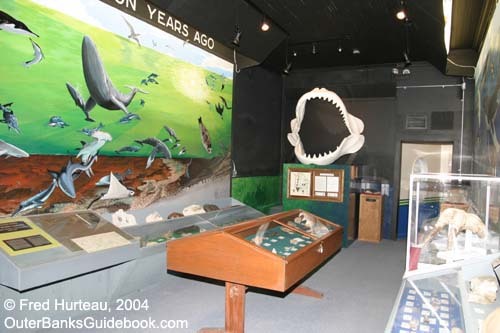 This small museum is packed with fossils, bones, shark's teeth, arrowheads, and other items found in the diggings from the phosphate mine. 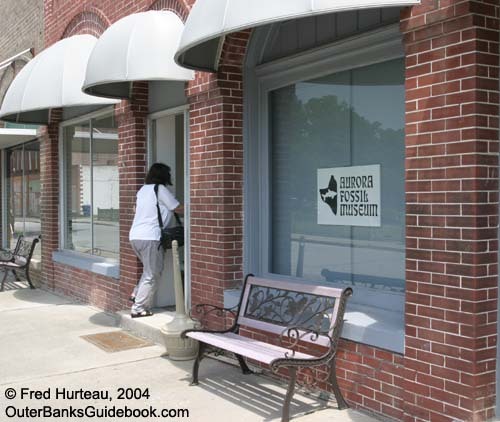 The museum is easy to find. Turn east off NC 306 next to the school. The turn is plainly marked by a sign, and you only have to drive 3 or 4 blocks off the highway to reach it. Across the street in front of the museum there is always a pile of dirt from the mine in which visitors can dig and sift for their own fossils free of charge. Bring a shovel, bucket, and maybe a wire screen sifter, and you're in business. You're practically guaranteed to find fossils in no time. The author's wife spent just five minutes with no tools but her bare hands, and found two specimens in short order. The pile is changed every few days, so there is no shortage of fossils to be found. 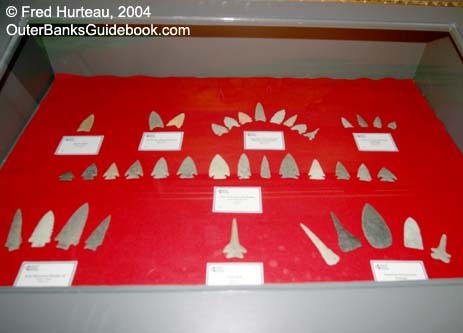 Children are fascinated with it, and it's a great break for the kids on a trip. If you bring your own buckets, you can fill them up and take them with you. 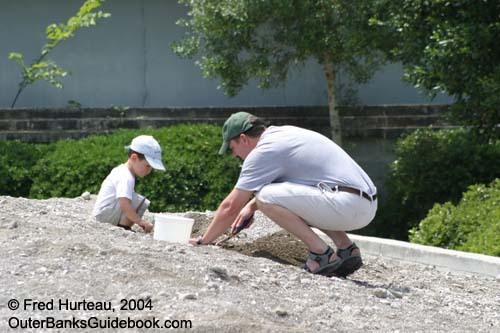 Then you can sift through them later when you get home, or entertain the kids with the project later on your trip. 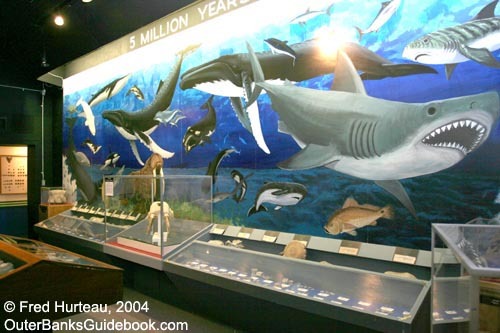 Here are some views of some of the displays and dioramas in the museum. If you're feeling adventurous, you might stop for a snack at the Wayside Family Restaurant in Aurora at the intersection of NC 306 and NC 33. On the menu, under "Wayside Famous Dinners", is a selection called the "Hot Hamburger Plate". This is no doubt a "local" delicacy, which consists of two beef patties on two slices of white bread with French fries, smothered in brown gravy for only $4.75. It wasn't exactly clear whether the patties and bread, or the fries, or both were smothered. Are you feeling lucky? 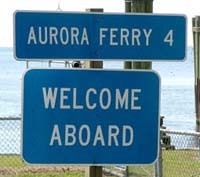 Continuing south from Aurora on NC 306 takes you through Grantsboro and Arapahoe to Minnesott Beach, and the landing for the next ferry.